Zoom Page WE (which I have permanently disabled - just there for 'emergencies'. it contains several (what should be images) that do not get displayed. What gets displayed is a rectangular box, which should display the image inside it, but with no image. I tried manually disabling all my addons and then rebooting FF. This makes no difference, the images still do not display. I then tried enabling all the addons again, but then booting FF into safe mode. I do this booting into safe mode via the menu Help > Restart with addons disabled... route. When I do this the images do get displayed properly. Can someone explain what is going on with this? And also how I fix things so that the images will always be displayed in the Guardian articles. P.S. This has been happening spanning several versions of FF, not just v66.0.3. Last edited by BuddhaNature on April 12th, 2019, 10:51 am, edited 1 time in total. Not seeing the issue here running Firefox 66.0.3 under Win 10. Dan, what I was saying in my original post is that the problem does disappear if I use Safe Mode. Sorry if that wasn't clear in my first post. Try disabling hardware acceleration to see if Firefox and the video drivers on your computer are not working well together. (2) One by one added all my addons to the new profile. The images still displayed fine. Nothing broke. (3) Started to step through FF (menu) Tools > Options > Privacy & Security > Content Blocking. As soon as I saw those options I was hit with inspiration and restarted FF with my Old profile (the profile I've been using for years and which I like). Custom (choose what to block) -- this was the setting I had chosen. Following the advice offered as help at those FF settings: "Blocking cookies and trackers can cause some web sites to break. It’s easy to disable blocking for sites you trust. Learn how"
I went back to the Guardian webpage that was causing the problem and via FF's inbuilt blocker disabled blocking for that site. Result: the images were all displayed as they should be. Okay, so I found what was causing the issue, but I'm not happy with what I have to do to cure it. Once blocking is disabled for that site (via FF) the list of cookies and trackers that FF shows as being enabled looks like a horror-show. Funny thing is that with blocking enabled (via FF) AdBlock Plus shows it is blocking 14 items. And with blocking disabled (via FF) AdBlock Plus shows it is blocking 40 items. Mmm . . . Swings and roundabouts it seems. FF disables the block and AdBlock Plus reaffirms, I would suspect only some aspects of, the blocking (it seems). Thanks very much for the help and the pointers, appreciated. Last edited by BuddhaNature on April 13th, 2019, 4:15 am, edited 4 times in total. Alternatively, can you live without photos on that site? Or wipe your cookies after each reading session? Well, Foxy, I live in the UK so the UK site is the one I use. I just tried the US site and the result is the same - some images don't show if I don't unblock the site. I have a suspicion that this is in some way to connected to where the images are being served from. 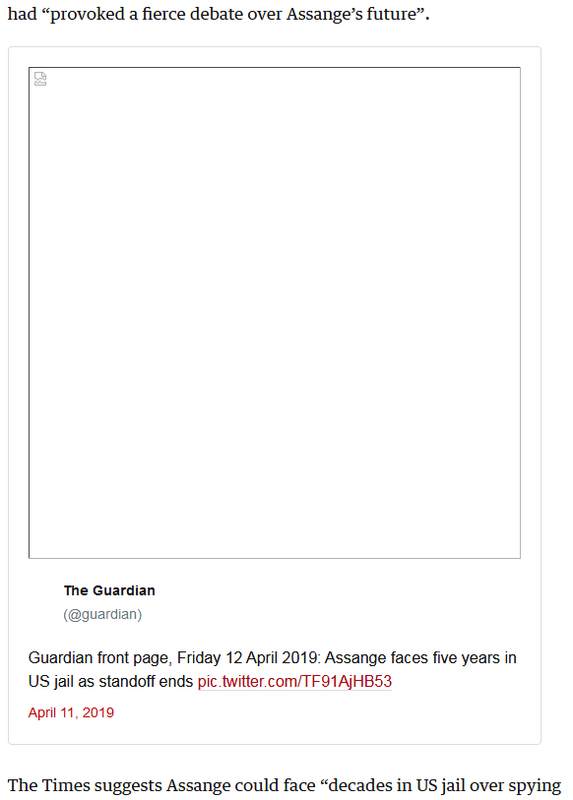 I don't think the Guardian is hosting the (missing) images themselves - they are, in effect, being served to the Guardian webpage from elsewhere (hence the problem with 'third-party' settings that I was experiencing). But in all of this I am just guessing, area is too above my pay-grade for me to be 'sure'. Still at least I know how to temporarily fix it now if needs be. 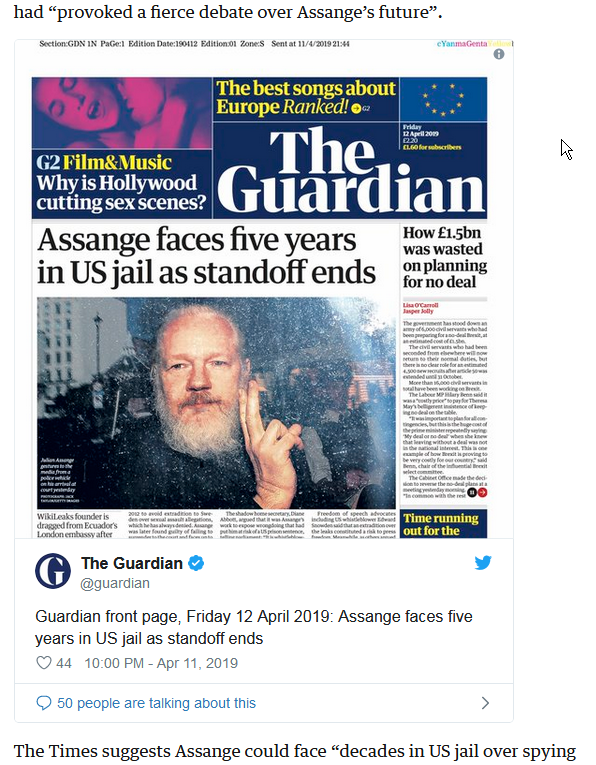 Don't, though, trust the Guardian any more -- it's turned into a publishing organ on the part of the UK Security Services -- so I wouldn't want to permanently disable tracking for the Guardian. It's looking an awful lot like a tabloid. You might be better off without the pics. Note that you should see the shield icon in the location bar in case Content Blocking is blocking content or a shield icon with a strike-through when you disable Content Blocking for this page. The Web Console should show what content is blocked. Hmmmmm, maybe there's a way you can still use Content Blocking. I don't use that, but I enabled it to see what happens. Everything shows perfectly fine. So, maybe the problem is that you have Adblock Plus and Privacy Badger installed. I used to use both of those but found out that they cause many display issues. I've been using uBlock Origin and it's a million times better than Adblock Plus. Try uninstalling Adblock Plus and Privacy Badger and then install uBlock Origin with Content Blocking enabled and see what happens. BTW, with Content Blocking enabled, uBlock Origin went from 14 items blocked to 17 blocked.